A couple of people responded to my previous post about education and the need for three pillars: liberal arts + STEM + vocational training. They point out that a movement exists to expand STEM to STEAM—to integrate arts education into STEM education. I disagree with this idea. I’m convinced that liberal arts and STEM education need to be allowed to flourish each on their own and to interact with each other as equals. I feel that STEAM initiatives intrinsically subordinate the arts aspect to the larger STEM aspect. But my concern about STEAM speaks to something deeper. At their cores, both liberal arts and STEM educations seek to teach strong critical thinking skills. They use very different methodologies to do so, and are based on different structures of reasoning, logic, discourse, etc. I know many people for whom STEM education doesn’t work. Their minds simply don’t respond to that teaching methodology, to those structures of knowledge. Likewise, I know many people for whom liberal arts education doesn’t work and for the same reasons. If the goal is to promote critical thinking skills, it’s obvious to me that we need to maintain multiple avenues for people to get there. Intentionally conflating different educational methodologies and pathways is a mistake. Cramming them together narrows the options available for people to learn the critical thinking skills they need in ways that are best suited to them. I believe that this can only reduce the efficacy of education overall. Please read this article. He makes an important point. The headline, as always, is composed to be divisive—his argument is more nuanced than the headline lets on. Let me start with this: STEM education is important. Despite the headline, this article doesn’t try to argue that it isn’t important. Looking back at the history of education in this country, it seems to me that we were at our best, our strongest and most successful, when we had a balance across three arenas of study: liberal arts + STEM + vocational training. We need all three, equally. Liberal arts, in particular, is what stood us apart from much of the rest of the world during the 20th century. We also had far-and-away the most robust and most affordable vocational training in the world during the middle section of the century. Liberal arts tracks have been under attack for pretty much my entire life, and prior. Vocational training in this country has been utterly gutted over the past decades. STEM education is important but I also worry that we emphasize it at the expense of reestablishing this three-pillared balance. The passing of Sir Terry Pratchett hurts. It’s not normal for me to get caught up in the passing of a celebrity. I might take part in conversations about issues surrounding them (as I did with Robin Williams and depression) but Sir Terry is different. His death hits me personally. Reading his work left you with the sense that you now had a personal connection with him. His words were so open and forthright, you felt that he was sharing his soul with you in a way that is rare. His characters found homes inside each of us, they became a part of us, on a level more intimate than any other author I know of. To everyone who read and treasured his work, he wasn’t just a favorite author—he felt like a friend. Sir Terry taught me about being human. I’m glad that he has been freed from his suffering. But I’ll truly miss his words. The world has lost a great man and wondrous soul. The best way to honor this great man is to donate to The Research Institute for the Care of Older People. XKCD’s tribute to Sir Terry is beautiful and perfect. “Terry Pratchett was fantasy fiction’s Kurt Vonnegut, not its Douglas Adams” by Wlliam Hughes (posted by the A.V. Club on March 12, 2015). Read Cory Doctorow’s post on the passing of Sir Terry. Read the announcement from the BBC. 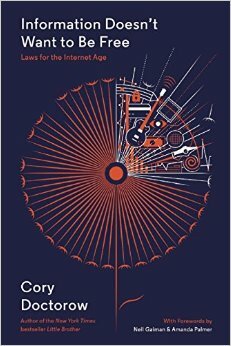 I recently reviewed Cory Doctorow’s book, Information Doesn’t Want to Be Free. Copyright is a passion of mine and I think this is a good opportunity to summarize my position on the matter. For me, the single most important aspect of copyright is the public domain. Most of the major copyright reforms over the past half century have made it a priority to prevent creative works from entering the public domain for as long as possible. On the other hand, there are many creative workers and educators of all stripes who depend on public domain materials to do their jobs—people who can’t afford to pay for usage rights to copyrighted stuff. This is one of the central conflicts of our copyright system.